This year’s topic, introduced by Gerfried Stocker, artistic director of the event, is artificial intelligence, which is central to the exhibition “AI The Other I”. Where we discover machines that artists qualify as “learning”. Some of them, such as the one entitled “Asemic Language”, even try to express themselves with more or less success. Failure reassures us in this robotic installation conceived and produced by So Kano, in collaboration with Takahiro Yamaguchi. 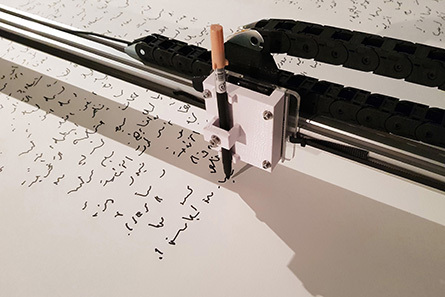 The machine has studied the writings of a dozen other international artists to only remember the shapes, in order to write, or more precisely to practice a form of automatic writing. 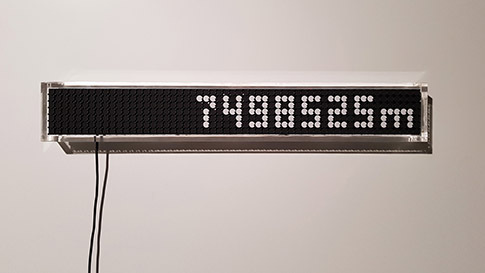 While the title of this work mentions the loss of language, the machine only preserves the writing’s shape, which puts us all on an equal footing in our capacity to understand it. From Mesopotamia to Silicon Valley and from civilizations to companies, women and men, together, have been able to create languages while the two Japanese writing machine only simulates them. But isn’t it beyond the great myths of singularity the way machines are limited ? The other trend that is reinforced each year in Linz is the one of hybrid art, of which the Golden Nica was awarded this year to Maja Smrekar. For some time now, this Slovenian artist focuses on the relations that we have always had with wolves as well as with dogs. 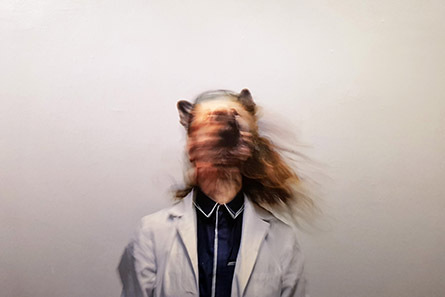 Her approach resolutely symbolic conveys that of Joseph Beuys, (“I like America and America likes Me”) sharing his living space with a coyote in 1974, but also that of Marina Abramovic (“Dragon Heads”) offering her face to pythons in 1990. Maja Smrekar questions the role of the human in dog evolution, and more specifically on the role of women and their extreme proximity to wolves that they possibly raised a long time ago. Indeed, we were already living together with wolves tens of thousands of years ago, to finally domesticate dogs. Domestication inevitably goes through the crossing of species. It is interesting to note that after having essentially held the attention of the relation between art and technologies, a festival like Ars Electronica today interrogates the relation between biology and cultures. 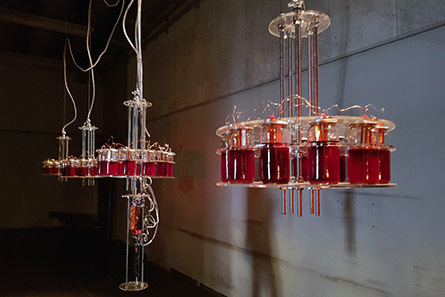 Between biology and technology, is the sound installation “Until I Die” by Dmitry Morozov aka ::vtol::. In the exhibition room of the former mail sorting facility located in the railway station of Linz, the installation updates the eponymous performance that the Russian artist gave on December 6th, 2016 at Kapelica gallery in Ljubiana. When, on stage, he has his blood taken, that blood that participates actively to make the sounds of music that the audience perceives live. Indeed, 18 months ago, while planning a sound performance using a synthesizer electrically powered by his blood, the artist started collecting it. His blood has been treated in order to preserve its color and homogeneity. The four and a half liters of the artist blood that the units of the synthesizer contain constitute its source of supply in accordance with the methods discovered by the physicists Luigi Galvani and Alessandro Volta during the 18th and 19th centuries. At the Kapelica gallery, which is led by its founder Jurij Krpan, this experiment that goes beyond the boundaries of arts and sciences lasts more than eight hours. That is, until it ends, by lack of energy, hence the work’s title. Besides, the artist, during the agony of the instrument, is contemplating his work which symbolizes perfectly the gift of self, as a natural extension of its own vitality. If there is an artist that has emerged among biotechnologies on the international stage, it is Eduardo Kac. But it is with a totally different work that he comes back to Ars Electronica. A resolutely poetic work that Thomas Pesquet activated on February 18th 2017 on board the International Space Station. For this performance, the artist started by anticipating the gesture through a series of photographs. He also taught the French astronaut to fold of the sheet of paper that he was about to find on board. The “Inner Telescope” which escapes earth‘s gravity that is staged by the video sequence presented to Post City is not oriented in any particular direction, but in all directions. In some point of views, we read the letter “M” that starts the word “Me”, representing the inner self that is pierced by many questions that remain unanswered. Unless it is a representation of the cosmic rays that, constantly, pass through us without ever reaching us. The earth’s roundness, seen from behind the ISS’s panoramic window, betrays its extreme fragility in this macrocosmos of which we will never truly understand the limits, even from a strictly theoretical point of view. As a sign of the times, the art market appeared at Ars Electronica, fifteen galleries were invited among which we note Berlin’s Gerken. Where it is still about the International Space Station, as it fascinates all of us in the sense that it represents a step towards elsewhere, which is the unknown. Because the French artist, Thibault Brevet, constantly measures the distance that separates the “Entangled” installation from the ISS. The absence of gravity that confers its calm on the inner space of the station is thereby opposed to the extreme speed of its rotations. Another work, “Thermal Cycling (3 copper rods, 2017) which is by the same artist, measures the lengthen of a tiny series of bars made of copper subjected to cycles of heating and cooling. This interest for the measure from the infinitely large to the infinitely small sends us back to the artists who also have practiced measuring: from Marcel Duchamp, dropping meter long strings from a height of a meter in 1913 (“3 stoppages-étalon”) to ORLAN measuring streets and institutions with her body since 1974 (“MesuRage”). With our relation to space, as well as to technologies that allow its measuring to constantly evolve, we are definitively not done with this aesthetics of the measure. 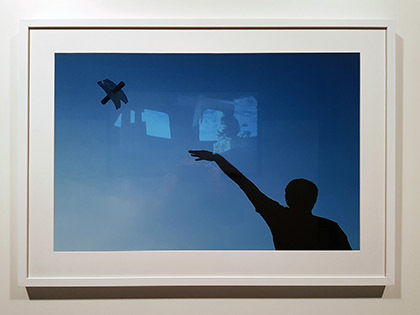 Still in the Gerken gallery of Berlin, are also presented the works of Stefan Tiefengraber that the digital community knows well. It is a series of drawings with automatic writings. The artist, firstly, conceived the device entitled “Delivery Graphic” which he has gotten used to sending to himself by mail since 2013. The drawings are the product of the movements of the postal package that, during its journey, tell their tribulations. 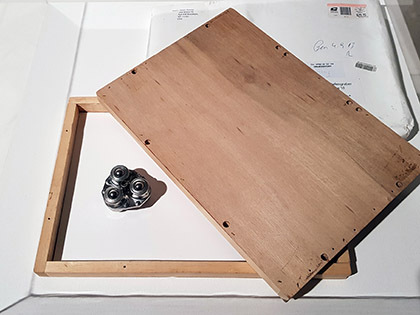 In this mail art experiment, it is the movement that makes the artwork while the Austrian artist is only in the role of the receiver. The latter has other apparatus such as “Your Unerasable Text”, connected to the notion of correspondence. Presented by Ars Electronica Center on the other shore of the Danube, the work has a telephone number allowing the audience to send text messages that are printed before instantly being shredded. But make no mistake, only the visible part of these messages is eradicated, while the artist has stored them in their digital version since 2011. Exactly as we delete an email from our interface without knowing anything about its non programmed obsolescence! Ars Electronica has also developed along the same lines as the improvement of search engines and the releases of 3D computer-animated films. The event has kept up a real interest in the genre, perpetuating its Animation Festival. And it is precisely in this context, again a sign of the times, that we note the presence of the emerging American artist Jonathan Monaghan with whom the work is more generally associated with the contemporary art world and more precisely with the post-Internet trend. 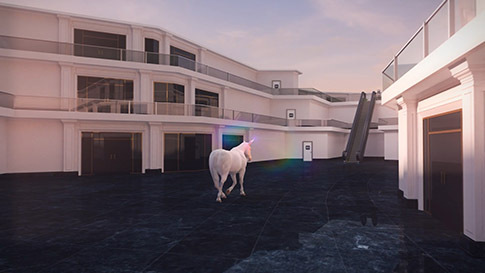 While we can easily imagine the photographic or sculptural consequences in his movie entitled “Disco Beast” of which the end is similar to the beginning, it is question of an eternal return: the unicorn’s return. Although being a legendary creature, its traces in the West date back to Greek antiquity. Today, it occupies our servers. Supposedly fierce, the unicorn represents the purity that is expressed in the sequence of this young New Yorker, by the light colors but also with the lack of any human beings, although there is a city that reminds us of the gated comunities, which are none other than the contemporary interpretations of the ideal cities of the humanist painters and architects of the Renaissance. They are equally perfect because they have not yet been inhabited by the imperfect beings that we are and will eternally be. Written by Dominique Moulon for ETC MEDIA and translated by Garance Moulon, September 2017.